We met a group of college students in Entebbe that were just full of wonder and questions. They were so friendly, fun and gave us just a great feeling of Uganda in general. I also really enjoyed watching life go by in Uganda. It was so beautiful, the people and the countryside. My cousin's boss booked through Go2Africa so we did also. They were wonderful. We worked with them for over a year to get just the right combination of everything that we wanted to do. Both Volcanoes and Rangers were great. Amon, our guide at Volcanoes, acted more of a leader/coordinator. He took really good care of us. Of the two companies, I like the land cruisers at Volcanoes the best. The roof slid out and you could see out of the front window from the back seat. The tour was put together well as we would have a busy day then a more relaxing day. Although I must say that I needed a vacation after the vacation! Also Volcanoes provided all the water that we wanted and when we were craving cold water, Amon went and got ice from one of the hotels and put our water on ice. For Rangers, Prosper was our guide. He had 16 years of experience and a wealth of information. He was so patient with us and also took really good care of us. We could not see out of the front window from the back seat in the Ranger vehicle but got used to the pop-up roof as it provided shade. Rangers provided 1 liter per person of water a day. Laico Lake Victoria Hotel in Entebbe was a standard hotel in a beautiful setting. Ndali Lodge outside of Fort Portal and Kibale was one of my favourites. It was located on top of a ridge with views of Queen Elizabeth Park and the Rwenzori Mountains. Each cottage had a view to remember. Mweya Safari Lodge was located in Queen Elizabeth Park with views of Lake George and Lake Edmond. It had more of a hotel feel. Volcanoes Bwindi Lodge was all inclusive including laundry, alcohol and massages. Very green; compost toilets and bush showers. The cottages were cozy and comfortable. The person assigned to take care of us was great. Mountain Village Lodge was ok. We had a little problem getting service there and the shower wouldn’t work. But the huts were very cozy and the main lodge was wonderful. Tarangire Safari Lodge was my second favourite. Basically military style tents with hard walled bathroom; we were right in the middle of nature. We had wonderful experiences here. E Unoto Retreat was great. There were only 2 of us as guests that night and still they had musicians and acrobats to entertain us. We were treated like royalty. The room we had at Ngoronogoro Serena Lodge had a view of the crater to die for. The food was just ok and with this Serena Lodge and the one at the Serengeti, we seemed to have a problem being two women by ourselves in where we were put to sit for dinners. The Migration Camp was my favourite but as a warning, it was also a splurge. They are all inclusive. We were both sick by this time and they took great care of us. The camp hosts were wonderful as well as Julius, our waiter. The Serengeti Serena Lodge was nice as all of the Serenas. Most breakfasts that we had were wonderful. Either there was a buffet or the standard faire was on the table (fruit, bread/toast, etc.) then they would take our order for eggs and meat. Most lunches were either buffets or box lunches. When an African lodge packs a lunch box, they do not skimp on the food. Of all of the non-buffet dinners, the Migration Camp stood out by far. E Unoto Retreat was also very accommodating and went out of their way to provide a great meal. Ndali served a great home-cooked meal. Loved it. What didn’t we see? We saw topi, waterbuck, impala, kob, bushbuck, dikdik, reedbuck, Thompson’s Gazelle, Grant’s Gazelle, coke hartebeest, klipspringer, steenbok, all kinds of birds from Marabou Storks to all kinds of Kingfishers, Hornbills, Heron, Jacana, Lapwings, vultures, etc. We also saw African buffalo, cheetah, chimps, elephants, giraffes, mountain gorillas, hippos, hyenas, 4 leopards, olive baboons, vervet monkeys, black and white colobus, blue Sykes monkey, red-tail monkeys, warthogs, wildebeest, zebras, silver-backed jackals, slender mongoose, leopard turtles, hyrax, lizards, crocodiles, a black rhino, bat-eared foxes, a black mamba snake and a skink. We watched a black mamba snake crawling up in an abandoned bird nest. It was fascinating to watch as it slowly made its way up the tree. As I’m photographing the snake, I heard a noise in the grass below, and as I lowered my camera, I was looking eye to eye with a beautiful leopard. She stared directly at me and I stared in awe at her as we were trying, just for that moment, to understand what the other was all about. As I slowly rose my camera and the shutter went 'click'… the other vehicle rushed over to see what was going on but she was already gone. 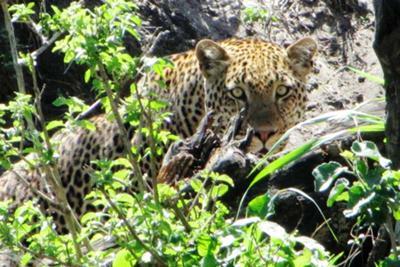 We spotted a leopard lying down near a small gulley. Our guide believed that there were a cub or two but we never saw them. She slowly moved up the spindly tree and skilfully worked her way up until she disappeared into a thicket of pencil thin branches. Our guide noticed it first (it's amazing what these guides can see before anyone else). The clever leopard had her kill expertly hidden in this wooded refuge. After killing the Thompson's Gazelle, she had dragged it up into her hiding place and now she was going to drag it down again. Somehow watching the two (leopard and gazelle) together, they made a cohesive unit; like this was the way it was meant to be and artistically they made the most awe-inspiring sight; the beauty of each complimenting the other. Once successfully on the ground, she continued to devour her prize. Serengeti - Hippo pool walk at Migration Camp; balloon ride (do it, but I expected to see more animals). Think about what you want to see and how touristy you want the trip to be. Certain countries have experienced a greater degree of tourism than others. Some people are ok with a lot of others being in the same place where others desire places to be more remote. If you can afford it, definitely go with a private tour and work with your tour director to come up with your own itinerary. Go just before the beginning of the busy season or just after. You may risk some bad weather but it can be worth not fighting with a lot of others to see what you want to see. My convertible pants and my iTouch with apps for Swahili, currency & time conversions and alarm were most useful. I read the free wildlife photography e-book before I left and made sure I understood everything inside of it. Taking pictures in Africa was the best experience of my life. I'll never forget it and now have the pictures to treasure. I used Go2Africa for my South Africa safari 21-24 July 2009. They did great, always helpful and responsive to questions. I stayed at Simbambili Game Lodge in Sabi Sands for 4 days - wonderful food. I saw the big 5 plus so many more! A typical day was 5am tea, the dawn game drive, 9:30am breakfast. Leisure. 2:00pm lunch. 3:30pm evening game drive. Cocktails at sunset. Hot towel and a glass of sherry on return 7:45pm cocktails and dinner. I had to measure the weight of the luggage I would take to Kruger airport 20 kilograms. Before the safari I saw all of the sights in and around Cape Town when I was there for a conference. Plan ahead with a good company... I had the trip of a lifetime! Join in and write your own page! It's easy to do. How? Simply click here to return to Africa Tour Operators Reviews.